This study was to evaluate the effect of bleaching teeth with whitening toothpaste on tooth whitening and mineral contents. We randomly assigned 40 human anterior teeth to two groups as follows (n=20): general toothpaste was used in Group 1 as control and whitening toothpaste was used 3 times a day for 3 min in Group 2. The total study period of the enamel specimens in each group was measured for 8 weeks at 2-week intervals. After each application, teeth were washed distilled water and subsequently immersed in artificial saliva. The color changes of the teeth were numerically characterized based on the Commission Internationale de L’Eclairage (CIE) Lab Color system. The main mineral contents of the enamel surface were analysed the field emission electron probe micro analyser (FE-EPMA: electromagnetic wave). The data were analysed using Student t-test with SPSS 20.0 statistical computer program (SPSS Inc., USA). The overall color changes (ΔE) were 6.18 ± 1.15 in Group 1 and 13.41 ± 1.86 in Group 2; the ΔE values were significantly different after 8 weeks of application (p<0.05). The whitening toothpaste improved the whitening efficacy of the enamel by a factor of 2.2-fold compared to that by the control toothpaste. Further, the mineral content did not appear to differ between the groups (p>0.05). Whitening toothpaste provided effective tooth whitening, and the efficacy increased in a timedependent manner. Moreover, the application of whitening toothpaste did not have a deleterious effect on the enamel. Calcium, Dental hard tissues, Field emission electron probe micro analyser, Phosphorus, Toothpaste, Tooth whitening. The aesthetic issues associated with discolored teeth can cause reluctance in interpersonal relationships and a lack of confidence. Therefore, dental whitening has become a popular service for improving the aesthetics of the teeth, getting settled as an important part, and active research has been carried out on this topic. Dental whitening refers to a technique in which chemical action is used to achieve a whitening effect; the chemical removes discoloration by oxidizing the discolored sections in the tooth structure and restoring the tooth to the original color . The reported mechanism of dental whitening is that strong oxidation dissolves protein in the enamel and dentin, resulting in whitening, but the exact mechanism has not yet been identified. Hydrogen peroxide (HP) and Carbamide Peroxide (CP) have been widely used as representative whitening materials . Dental whitening procedures are divided into in-office whitening and at-home whitening techniques . The at-home whitening technique is performed the patient with a whitening material usually containing 15-20% CP for several weeks . In contrast, in-office whitening is performed in the dental office under a professional’s supervision with a high concentration of HP (35-50%) and a high-intensity light source . Although the use of a light source has merit because it causes a fast whitening effect, several studies have shown that this technique has adverse effects on the teeth [6,7]. The oxidizing agent has side effects such as tooth fracture, damage of the dental hard tissue , reduction of microhardness , increased tooth sensitivity , pain and/or burning sensation of the gums , cervical resorption , and an increase in the penetrability into the dentinal tubules . Thus, interest is increasing in dental whitening procedures that are inexpensive, are not associated with harmful effects on the dental hard tissue, and are effective and safe. Tooth brushing has aesthetic functions such as refreshing the oral cavity, cleaning the teeth, and improving the appearance of the teeth; additionally, tooth brushing serves the primary purpose of preventing dental caries and periodontal disease. Recently, toothpastes that contain ingredients for a variety of specific purposes are commercially available; among these, whitening toothpastes, which are most closely associated with favorable aesthetics, have been extensively researched and developed. However, despite the fact that the availability of whitening toothpastes that are easier-to-use is increasing, unlike the existing whitening methods, their whitening effects and impact on teeth have not yet been analysed properly. Therefore, the purpose of this study was to analyse the impact of using whitening toothpaste for 7 weeks by evaluating changes in the enamel surface and to compare and analyse their major inorganic ingredients. Extracted human incisors without formative corruption and damage such as dental caries, cracks, wear, and discolorations as assessed by observation with a zoom stereo microscope (SZX7, Olympus, Tokyo, Japan) were selected for this study. All teeth were stored in a 0.4% sodium azide solution until required. Only the coronal part of 40 teeth was used for slicing by a hard tissue cut-off machine (Accutom-5, Struers, Copenhagen, Denmark) in the cemento-enamel junction. The teeth were cut to produce a flat enamel specimen (3 × 3 × 2 mm) and were subsequently subjected to step-by-step abrasion with #600, #800, #1200, and #1800 abrasive papers. The enamel specimens were divided into 2 groups (n=20). The materials used for the experiments are listed in Table 1. The overall design of the experiment proceeds is the same as Figure 1. Table 1. Composition of experimental materials used in this study. Figure 1. Study process flow chart. Group 1 was treated with general toothpaste 3 times (in the morning, afternoon, and evening) on the tooth for 3 min, followed by cleansing with sterile distilled water and maintenance in artificial saliva. Group 2 was treated with the whitening toothpaste 3 times (in the morning, afternoon, and evening) at a thickness of 1 mm on the tooth enamel surface equally for 3 min. This treatment was followed by cleansing with distilled water and maintenance in artificial saliva after the treatment. This process was repeated for a total of 8 weeks, and the artificial saliva for each group was changed 3 times a day. The color changes of the teeth were observed at 2-week intervals, and the surfaces changes and tooth components were analysed after washing distilled water. To evaluate the changes in Calcium (Ca) and Phosphorus (P), the main constituents of teeth, the distribution of the overall chemical composition were measured using a quantitative analyser, the field emission electron probe micro analyser (FEEPMA; JXA8530F (5 CH), JEOL, Tokyo, Japan). The beam size was 10 μm, the acceleration voltage was 20 keV, and the beam current was 20 nA (to detect Ca and P ingredients up to 100 μm under the surface); the enamel surface weight percent (wt (%)) was measured at 3 points. The SPSS statistics program (Version 20.0, SPSS, Chicago, IL, USA) was used for statistical analysis. Changes in tooth color and the main ingredients (Ca and P) were analysed using Student’s t-test. The level of significance was set at 5%. The color change after 8 weeks of product application is shown in Table 2. A whitening effect was identified over time in the teeth to which the whitening toothpaste was applied. After 6 weeks, a significant difference was found in the whitening effects (p<0.05). After 8 weeks of observation, the ΔE value was 6.18 ± 1.15 for the regular toothpaste group and was 13.41 ± 1.86 for the whitening toothpaste group. Thus, this value was approximately 2.2-fold higher for the use of whitening toothpaste compared to the use of control toothpaste. *p-values are determined by Student t-test (p<0.05). Table 2. The overall color change (ΔE) after treatment with whitening toothpaste. The ΔE values were obtained over the 8-weeks. The results of a quantitative analysis on the changes of the major inorganic elements, Ca and P, are shown in Tables 3 and 4, respectively. The changes in the levels of Ca and P measured by applying the enamel specimens at a 2-week intervals for 8 weeks did not show any significant difference between the specimens in which the control toothpaste and the whitening toothpaste were used (p>0.05). Table 3. The average Calcium (Ca) change on the enamel surface. Table 4. The average Phosphorous (P) change on the enamel surface. The currently marketed bleaching methods and devices can be associated with a variety of side effects, depending on the type of method that is utilized. Some examples of reported problems are frequent clinic visits and high costs, the possibility of rapid color rebound, and the adverse effects of high-concentration bleaching agents on the teeth . Consumers prefer a dental whitening method that they can apply easily and conveniently for themselves. Thus, toothpastes with special purposes are easily accepted by many consumers. Among these numerous commercially available toothpastes, whitening toothpastes are popular in spite of their higher prices because they enhance tooth cleanliness, improve the aesthetic aspects of the teeth, and are easily accessible. Therefore, this study compared the effects of applying general toothpaste and whitening toothpaste by analysing tooth discoloration and major inorganic materials. This study used the CIELAB measurement system, which is appropriate for observing changes in brightness and analysing saturation . The color changes observed over 8 weeks at 2- week intervals were measured and analysed both with a constant light source and in a street environment under the same conditions. The teeth in the two different groups showed a significant difference at 6 weeks after application (p<0.05). The color change of the teeth to which the whitening toothpaste had been applied was higher by approximately 2.2- fold compared to those to which the control toothpaste had been applied. These results were due to the inclusion of the materials that help to achieve a whitening effect in the whitening toothpaste. The ingredients of this toothpaste include a cleaning and polishing agent, detergents, a bonding agent and wetting agent, and other ingredients such as a mix of water or a flavouring agent, sweet flavours, preservative, corrosion inhibitors, bleach, and preventive, therapeutic, or a mix of coloring agents . Whitening toothpastes function mainly to achieve oral cleansing and oral abrasion actions. Efforts have been made to develop whitening toothpastes with whitening actions. Fischma et al. reported the safety of toothpaste made from mixing HP and sodium bicarbonate, and Mehra et al. reported that toothpaste that contained a mixture of calcium peroxide and sodium bicarbonate with an abrasive material, silica, had a dental whitening effect. The representative cleaning and polishing agent used in these toothpastes is sodium lauryl sulphate, and the ingredient that had a whitening effect in the whitening toothpaste used in this study was a mix of a cleaning and polishing agent (sodium pyrophosphate and sodium lauryl sulphate) and an abrasive material (sodium silica) . Dental whitening procedures are now routinely used to obtain whiter teeth in a shorter period of time. Bleaching agents aim to bleach the chromogens in enamel and dentin, thereby whitening the color of the tooth . Many over-the-counter teeth whitening products are being used by people at home. White et al. confirmed that the whitening strips do not produce changes in surface morphology, fracture susceptibility of human tooth enamel under in vitro. These results support the clinical safety for tooth bleaching . However, numerous studies have investigated that the deleterious effect on a tooth’s structure is a controversial topic. The bleached tooth may incur a demineralization effect. EPMA can quantify the mineral density in the tooth and it is a non-destructive technique for demonstrating the distribution of minerals . Potocnik and Gaspersic  used EPMA to demonstrate lowered concentrations of Ca and P in all bleached samples after the use of 10% CP. Lee et al. showed mineral loss from bovine enamel by the use of 30% HP. Thus, bleaching agents can damage the tooth structure. Toothpastes are becoming available with a whitening effect, which benefits server as a strong motivation for its use . In this study, this shows that whitening toothpastes act, removing surface staining by sodium silica of the ingredients in the whitening toothpaste, did not affect the tooth structure. The mineral density was measured in order to determine whether the use of general toothpaste as the control and the use of whitening toothpaste had different effects on the tooth surface. A quantitative analysis of Ca and P revealed no statistically significant difference in the changes in these elements between the uses of the different toothpastes (p>0.05). Thus, both Ca and P did not have any impact on the major inorganic components of the teeth. This study showed that repeated application of a whitening toothpaste for 8 weeks brightened discolored teeth without affecting tooth inorganic components. Therefore, people can easily obtain whitening effects by using whitening toothpaste during their daily tooth brushing routine; this whitening method will promote favorable aesthetics without harmful effects on the teeth. When applied to the tooth surface of the whitening toothpaste, the ΔE values were remarkable change in tooth color. The levels of Ca and P components did not affect enamel surface for 8 weeks. The results of this study demonstrate that brushing the teeth with whitening toothpaste is safe for dental use. The authors report no conflicts of interest related to this study. The author does not have any financial interest in the companies whose materials are included in the article. McEvoy SA. Chemical agents for removing intrinsic stains from vital teeth Currents techniques and their clinical application. Quintessence Int 1989; 20: 379-384. Buchalla W, Attin T. External bleaching therapy with activation by heat, light or laser-a systematic review. Dent Mater 2007; 23: 586-596. Lim MY, Lum SO, Poh RS, Lee GP, Lim KC. 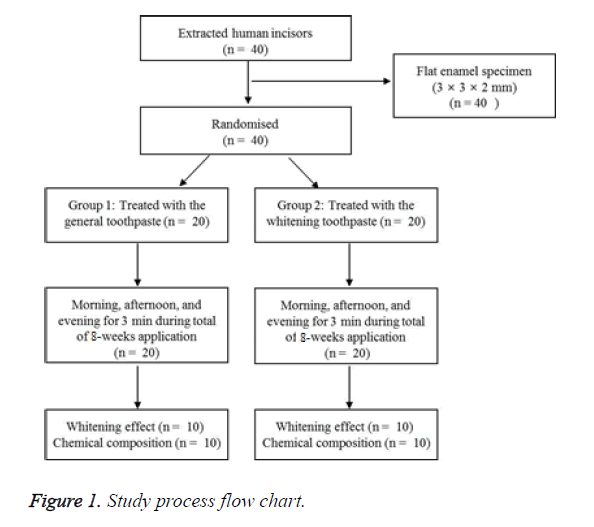 An in vitro comparison of the bleaching efficacy of 35% carbamide peroxide with established intracoronal whitening agents. Int Endod J 2004; 37: 483-488. Al-Salehi SK, Hatton PV, McLeod CW, Cox AG. The effect of hydrogen peroxide concentration on metal ion release from dental amalgam. J Dent 2007; 35: 172-176. Sun G. The role of lasers in cosmetic dentistry. Dent Clin North Am 2000; 44: 831-850. Attin T, Vollmer D, Wiegand A, Attin R, Betke H. Subsurface microhardness of enamel and dentine after different external bleaching procedures. Am J Dent 2005; 18: 8-12. Cavalli V, Arrais CA, Giannini M, Ambrosano GM. High-concentrated carbamide peroxide bleaching agents effects on enamel surface. J Oral Rehabil 2004; 31: 155-159. Josey AL, Meyers LA, Romaniuk K, Symons AL. The effect of a vital bleaching technique on enamel surface morphology and the bonding of composite to enamel. J Oral Rehabil 1996; 23: 244-250. Pinto CF, Oliveira Rd, Cavalli V, Giannini M. Peroxide bleaching agent effects on enamel surface microhardness, roughness and morphology. Braz Oral Res 2004; 18: 306-311. Dahl JE, Pallesen U. Tooth bleaching-A critical review of the biological aspects. Crit Rev Oral Biol Med 2003; 14: 292-304. Reinhardt JW, Eivins SE, Swift EJ, Denehy GE. A clinical study of night guard vital bleaching. Quintessence Int 1993; 24: 379-384. Harrington GW, Natkin E. External resorption associated with bleaching of pulpless teeth. J Endod 1979; 5: 344-348. Dezotti MSG, Silva SMH, Nishiyama CK. Evaluation of pH variation and cervical dentin permeability in teeth submitted to bleaching treatment. Pesqui Odontol Bras 2002; 16: 263-268. Joiner A, Philpotts CJ, Ashcroft AT, Laucello M, Salvaderi A. In vitro cleaning, abrasion and fluoride efficacy of a new silica based whitening toothpaste containing blue covarine. J Dent 2008; 36: 32-37. Villalta P, Lu H, Okte Z, Garcia-Godoy F, Powers JM. Effects of staining and bleaching on color change of dental composite resins. J Prosthet Dent 2006; 95: 137-142. Norman O. Harris, Franklin GG. Primary preventive dentistry. Prentice Hall (6th edn.) 2004. Fischman SL, Truelove RB, Hart R, Cancro LP. The laboratory and clinical safety evaluation of a dentifrice containing hydrogen peroxide and baking soda. J Clin Dent 1992; 3: 104-110. Mehra R, Vaidyanathan TK, Nathoo SA, Viscio DB, Gaffar A. The cleaning abilities of two bicarbonate-peroxide toothpastes. J Dent Res 1966; 75: 564-568. Jeong YS, Lim SH, Oh SH, Kang KH, Koong HS, Hwang SJ. Effect of dental plaque removal and preference about D.I.Y dentifrices. J Korean Soc Dent Hyg 2010; 10: 311-322. Brunton PA, Aminian A, Pretty IA. Vital tooth bleaching in dental practice: 2. Novel bleaching systems. Dent Update 2006; 33: 357-358, 360-362. White DJ, Kozak KM, Zoladz JR, Duschner HJ, Gotz H. Effects of crest white strips bleaching on surface morphology and fracture susceptibility of teeth in vitro. J Clin Dent 2003; 14: 82-87. Gotz H, Duschner H, White DJ, Klukowska MA. Effects of elevated hydrogen peroxide strip bleaching on surface and subsurface enamel including subsurface histomorphology, micro-chemical composition and fluorescence changes. J Dent 2007; 35: 457-466. Totdal B, Hals E. Electron probe study of human and red deer cementum and root dentin. Scand J Dent Res 1985; 93: 4-12. Potocnik I, Kosec L, Gaspersic D. Effect of 10% carbamide peroxide bleaching gel on enamel microhardness, microstructure, and mineral content. J Endod 2000; 26: 203-206. Lee KH, Kim HI, Kim KH, Kwon YH. Mineral loss from bovine enamel by a 30% hydrogen peroxide solution. J Oral Rehabil 2006; 33: 229-233. Rice DE, Dhabhar DJ, White DJ. Laboratory stain removal and abrasion characteristics of a dentifrice based upon a novel silica technology. J Clin Dent 2001; 12: 34-37.